If your drink dispenser isn’t edible, hit rewind. The star attraction of any summer bar cart, a spiked punch flowing from the mouth of a freshly-tapped fruit is the ultimate party trick. And there’s more than one way to tap into the season. Go big and greet party guests with a trifecta of ripe fruit: watermelon, pineapple and honeydew all beg to be kegged and filled with icy punches. Then, once you’ve conquered summer’s bounty, you can take your tap into fall with spiked pumpkins and squashes. Prepare to be invited to a lot of cocktail parties. Tips Before You Tap: Make sure to use a seedless watermelon. Otherwise, you’ll be picking every last pesky seed from the flesh before you can even think about tapping. To begin, level the bottom of the melon by slicing off a thin sliver. That way it will sit upright. Avoid cutting too deep into the flesh, as you don’t want liquid seeping from the bottom. Slice about ⅓ of an inch off the top of the melon to create the main opening and set the lid aside. Start scooping out all of the watermelon flesh with a spoon or ice cream scoop and put it in a bowl. As you’re scooping, pour any excess watermelon juice into the same bowl. Leave about an inch and a half of melon at the bottom to prevent leaks—but scrape the walls of the watermelon nearly down to the rind, saving all flesh and juice. Once the keg is hollowed out, choose the melon’s most attractive side for inserting the spout. Use the tapping kit’s coring tool to cut a hole about 1½ to 2 inches from the bottom of the melon. Don’t cut the hole too near the top or the tap won’t be able to dispense all of the liquid near the bottom. Insert the tapping kit’s faucet into the front of the spout hole and the shank piece through the inner side and twist until the faucet is firmly in place. Now, turn your attention to your reserved watermelon flesh and juice. To avoid clogging up the tap with fruit pulp, you’ll need to blend and strain the flesh and juice twice. Puree all of the watermelon until smooth and strain it through a sieve twice to remove all stringy bits. You’ll end up with about six cups of strained juice, which is enough to fill this watermelon keg with punch twice—in case your party demands a refill. Here’s the fun part. Elevate the watermelon keg on a cake plate or overturned glass for easy dispensing. Fill the keg with the punch recipe below, replace the lid and tap tap tap away. Add all ingredients to a large bowl. Stir well and pour into prepared watermelon keg, making sure the tap is closed. Fill the keg to the top with ice. Replace the keg lid and tap at will, garnishing each drink with a mint sprig. Tips Before You Tap: Select a pineapple that sits upright on its own if possible. If your pineapple’s a little wobbly, level the bottom by slicing off a thin sliver so that it sits flat. Avoid cutting too deep into the flesh, as you don’t want liquid seeping from the bottom. Slice about ½ an inch off the top of the pineapple, keeping the leaves intact (they create a fetching hat) to create the main opening and set the lid aside. Scooping out the pineapple flesh is slightly more tedious, due to the woody core. The best way to remove it is to cut a circle around the core with a sharp knife and a larger circle around the outside of flesh near the rind. Then slice the flesh into smaller strips and scoop them out the best you can (they don’t have to be pretty). Reserve the flesh and juice in a bowl as you scoop. Leave about an inch at the bottom to prevent leaks but scrape the walls of the pineapple nearly down to the rind. Once you’ve removed the flesh, cut out the pineapple core and discard it. Once the keg is hollowed out, choose the pineapple’s most attractive side for inserting the spout. Use the tapping kit’s coring tool to cut a hole about 1½ inches from the bottom of the fruit. Don’t cut the hole too near the top or the tap won’t be able to dispense all of the liquid near the bottom. Insert the tapping kit’s faucet into the front of the spout hole and the shank piece through the inner side and twist until the faucet is firmly in place. Now, turn your attention to your reserved pineapple flesh and juice. To avoid clogging up the tap with fruit pulp, you’ll need to blend and strain the flesh and juice twice. Puree all of the pineapple until smooth and strain it through a sieve twice to remove all stringy bits. You’ll end up with about one cup of strained juice, which is more than enough for the punch recipe below—plus a refill. 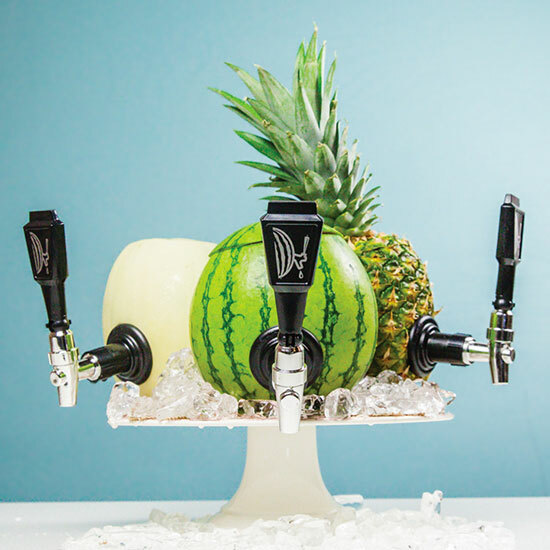 Elevate the pineapple keg on a cake plate or overturned glass for easy dispensing. Fill the keg with punch, replace the lid and tap tap tap away. Add all ingredients to a shaker. Dry shake and pour into prepared pineapple keg, making sure the tap is closed. Fill the keg to the top with ice. Replace the keg lid and tap, garnishing each drink with grated nutmeg. Tips Before You Tap: Beware the honeydew’s seedy core. Level the bottom of the melon by slicing off a thin sliver so that it sits upright. Avoid cutting too deep into the flesh, as you don’t want liquid seeping from the bottom. Slice about ⅓ of an inch off the top of the melon to create the main opening and set the lid aside. Honeydew melons have a seed-filled core, so you’ll have to maneuver around that. Cut a circle around the core and start scooping out the seeds with a spoon or ice cream scoop before you start on the rest of the flesh. Scoop and reserve the remaining flesh and any excess juice in a bowl. Leave about an inch and a half of melon at the bottom to prevent leaks but scrape the walls of the honeydew nearly down to the rind (it’s surprisingly thick). Now, turn your attention to your reserved honeydew flesh and juice. To avoid clogging up the tap with fruit pulp, you’ll need to blend and strain the flesh and juice twice. Puree all of the honeydew until smooth and strain it through a sieve twice to remove all stringy bits. You’ll end up with about one cup of strained juice, which is more than enough for the punch recipe below—plus a refill. Elevate the honeydew keg on a cake plate or overturned glass for easy dispensing. Fill the keg with punch, replace the lid and tap tap tap away. Add all ingredients to a shaker except for the seltzer. Dry shake and pour into prepared honeydew keg, making sure the tap is closed. Top with about 3 to 4 ounces of seltzer and fill the keg to the top with ice. Replace keg lid and tap at will, garnishing each drink with a melon ball.